Happy humpday babes! We are officially on the downward slope to the weekend and I don't know about you but I am definitely ready! I leave this Sunday for a conference in Las Vegas so I'm excited and not excited at the same time, if that makes sense. It'd be great if I was going for vacation but I know the conference is going to be long days and my sleep schedule is going to be all messed up so I'm already looking forward to next weekend when I'll be back. At least the weather in Vegas will be about what it's been like here in Florida, warm and sunny! Speaking of warm and sunny, I've been on a major spring/summer clothes kick lately. I've probably been spending WAY more than I should but there have just been so many cute things and so many great sales that I just can't help myself. This top was definitely one of those things that as soon as I saw it, I knew I had to have it. Stripes and bows are definitely two of my favorite things so when I saw this shirt combined them both, sold! It definitely didn't hurt that I scooped this up when it was on sale 40% off, I mean, who can say no to a good bargain? I love that this top looks great with jeans and shorts and it's not too revealing so I can actually get away with wearing it to work. If you haven't already noticed from my Instagram, this shirt is going to be on major repeat this spring and I'm not even the least bit sorry about it! Have you found that one piece for spring that you can't live without? You look summer ready in this look. Have a great trip to Vegas, even if it is for work, maybe you can sneak out for a bit just to relax in the sun! I love it! I cannot get enough of white denim right now too. I hope you have a good time in Vegas...even though it is for work. I am from Vegas, born and raised! Ok I NEED this tank! Seriously in love with the tie in front and the pretty stripes! You styled it perfectly!! such a cute top. and so versatile. perfect for the summer heat! and i hear you on the trip and all the time change stuff. here's hoping you find time for fun in between work! You look adorable and I love the top! Have fun in Vegas! You look so fab! Love your top. Have fun in Vegas. Have so much fun! I love this top - it is so fun! It's seriously the best when you find cute tops on sale, especially when they're ones that you love and will wear on repeat! I think that the bow detailing is so cute and will be perfect all spring and summer! I love that top too, I would buy it in a heartbeat. I cannot stop buying blue+white striped things for Spring. Loving your sandals and necklace also. Welcome by tomorrow to linkup with my Thursdays style linkup. Thanks and have a great day! I seriously have all of the heart eyes for this top. I'm obsessed with the bow tie in the front. Have fun in Vegas! The sales have been insane lately! Love this top, so cute on you and for the warm weather! Love the way it ties! You look great - I'm convinced you could pull off any look! This is the cutest top EVER! When I saw this in the ring post, I first thought it was dress -- I bet it would look adorable as a dress too. I love this top! The tie front is such a cute detail! Such an adorable tank! Loving your sunnies too! 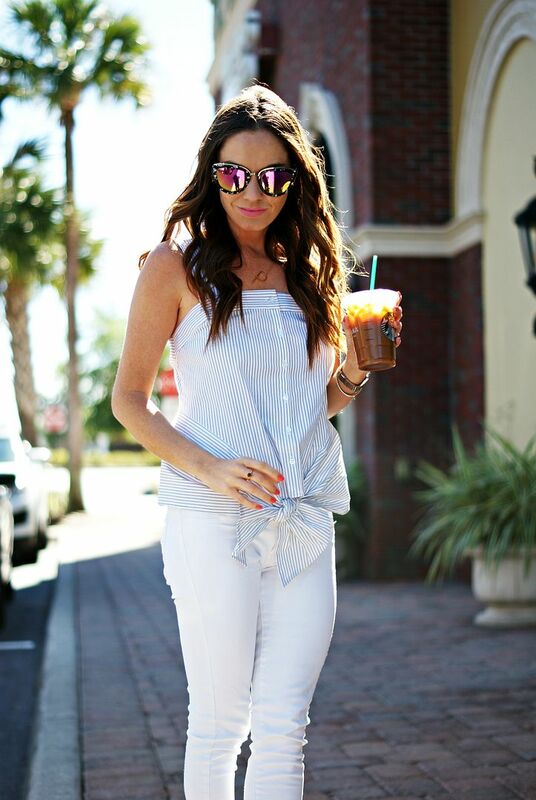 This outfit is perfect for spring & so fun! Hope you have a great trip to Vegas! 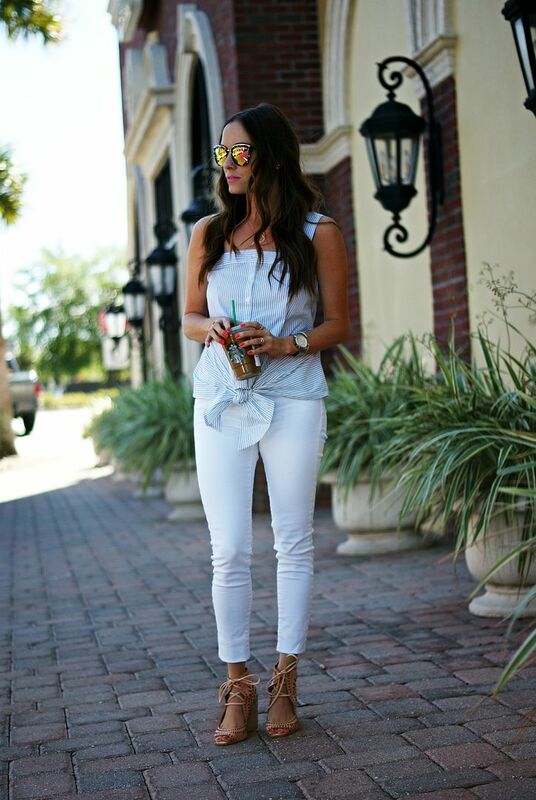 You look fantastic - I love the way you paired the top with the white jeans. Do you happen to know which color of sunnies you're wearing? There are so many options and I love the lens color you have on. Such a cute top! I wish it was still 40% off! A work conference in Vegas is just mean, that place is for fun! Enjoy anyway! I can totally see what you mean about being excited and not excited about Vegas. A work trip is bitter sweet. I hope you have a few friends from work that will be there too! I love your top today, the tie is just the sweetest! The details on that top are so cute! Loving white and blue so much right now! 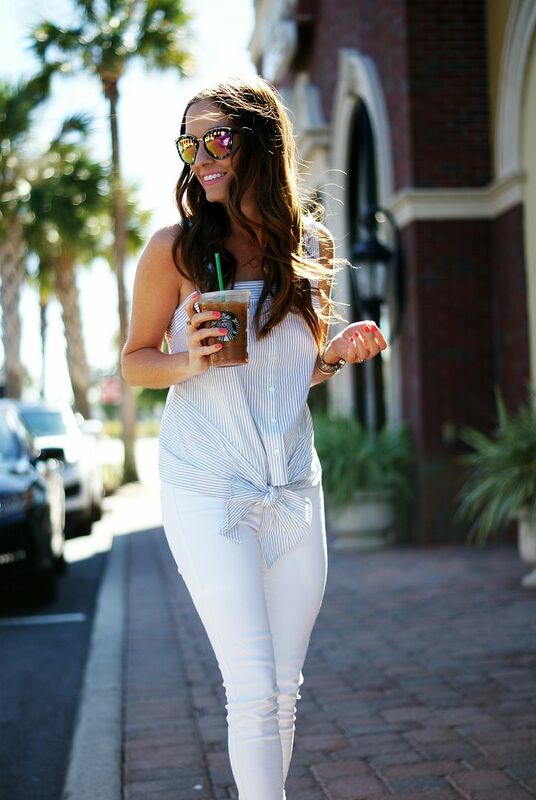 Adorable top and love the whole outfit! Have fun in Vegas...I hope you get some free time to explore and/or relax. The time change coming back is hard to adjust too but other than that Vegas is so worth the trip! This is the cutest top! I can completely understand where you're coming from with the conference... they can be so draining! This is SUCH a cute summer look!!! I love it! This top is SO adorable! I just love the tie detail! Enjoy the conference! This outfit is toooo cute, doll. 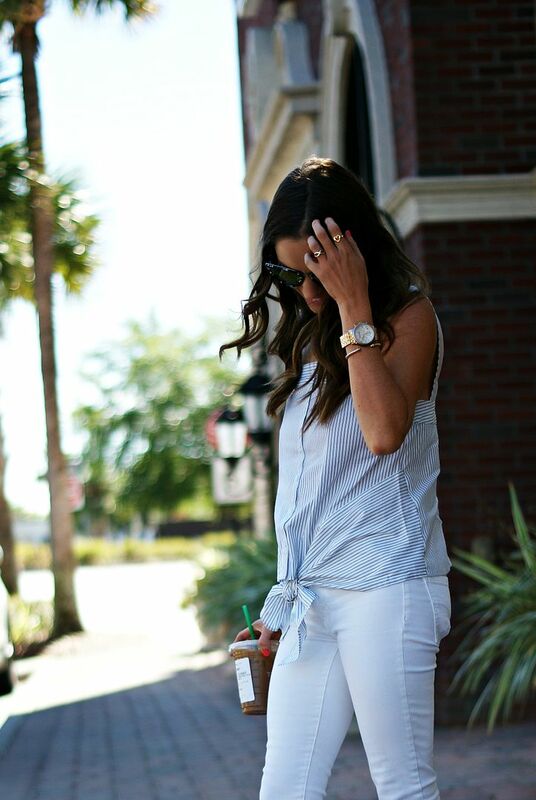 I love that top- quintessential summer piece! such a cute top! can't go wrong with stripes and bows!